Q: Did Wada Takuma-san and Kuroba Mario-san first meet in the Prince of Tennis musicals? Mario: Yes. I was in the Seigaku 7th cast and Wada-san was in Seigaku 6th cast. He's my senpai. Q: So you usually do not meet? Mario: Although, we're in the same baseball team so we have played baseball together. Q: What were your positions in the baseball team? Wada: He is our team's left-handed ace. Our precious southpaw. Mario: I'm in a long-term hiatus recently, though (LOL). Wada-san is our catcher. Wada: More or less, well, yeah. Wada: We were a battery then, right? Q: That's amazing! Did you just suddenly become a battery? Since I think it would be difficult to match each other's pace. Mario: Wada-san has an amazingly soft/gentle aura, doesn't he? That's why I matched with him without any worry. That doesn't apply to just baseball, though. I think it's a great thing. Wada: When I first saw him, I just finished my role in Tenimyu and it was Mario's turn to act in it and...how do I put it....he had a really sparkly aura. It was just for a moment when our rehearsals overlapped. Mario: It was during Seigaku Farewell Party, isn't it? Wada: Even though he was so young, it felt like he had a strong willpower to absorb a lot of things. There were several people there, but Mario and Shouhei's had the strong determination to learn things. Q: And did your impression of Kuroba-san change? Wada: The sparkly feeling in him hasn't changed at all (LOL). We don't really meet each other, but I hear his name in various places, so I know and really look forward to his projects. His efforts are really an honestly pleasing existence. So I think my impression of him hasn't changed at all. Q: What about Kuroba-san? What was your first impression of Wada-san? Mario: Since Wada-san was the captain of our senpai team, until before I met him I had this image that he was a stiff person. But when we finally met for the first time, he was actually a kind person with a gentle/soft aura. If I were to compare to something I'd say he's a good fabric conditioner! Mario: I wondered what kind of person he was so I chatted with him and found out that we're both from Tohoku region. I felt that that gave us a connection, and no matter what, I thought he was kind. Even now that impression remains the same. I guess you can say that he's oozing with good personality. Q: Nevertheless, about a fabric conditioner that is able to make even the surrounding atmosphere have a softer feeling, I wonder what reason did Kuroba-san have to say that (Wada-san is like a fabric conditioner)? Mario: You've become (soft like) fabric conditioner (LOL). But really, I've always wanted to co-star with you. Q: This time, you're both playing a double-protagonist role in the film "Sea Opening" so you have become costars at last. Mario: It's not our first time appearing together but it's our first time like this. Especially since it's not even butai but a movie. Wada: Right now we're at the script-reading stage, right? Kuroba: I've been in the care of Director Horiuchi Hiroshi when I appeared in "Please Please Please" and since it was a scene that's full of familiar faces, this work feels immensely like home. In any (work) location, the first step would always have an air of tension, and somehow you'd definitely feel a sense of distance. But here, there's nothing like that and it was easy to communicate with everyone[...]. 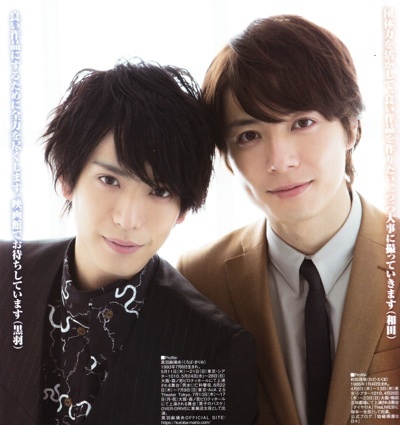 Wada: I don't have a lot of experience when it comes to starring in films so it's really difficult for me to imagine what happens in it, but as Mario-kun said, we have people with us that we can rely on during the shoot, so it makes me want to challenge a lot of things. Q: Speaking of "Please Please Please", let us ask the director of the same film how it would be this time with Sea Opening. Director: As Mario-kun had said previously, I knew him when he worked with us in "Please~" and now I am very happy that he is now going to play a protagonist in this new film. I wanted to give him more exposure after "Please~". I met Wada-kun before I started the script, and he didn't give off a fabric conditioner feel. It was more like a "high class fabric conditioner that celebrities use" kind of feel (LOL). He is really a handsome man without any faults, and it's natural for a human (like me) to like him. Q: Is the impression you have of them reflected on your script? Director: It feels like my impression makes use of Mario-kun's character admiring Wada-kun's character. The theme is how Wada-kun's character would accept different emotions from longing to respect. Q: So, it will be like Wada-san acting like a catcher to receive Kuroba-san? Kuroba: You're really connecting everything! (LOL) Takuma-kun is really a senpai that I can respect... If it's a person that I cannot respect, then this role would be difficult, right? (LOL) In that vein, I think it's an easy role. Wada: The kind of personality that is adored, respected, and liked...I don't really have it so I think by no means I can ooze it out of me... Until a month about the recording, I want to live an extremely honest life. Like giving up a seat on the train and stuff (LOL). Q: I also had the opportunity to read the script, and I think that you both have difficult roles because of the delicate acting. Wada: I haven't really shown anyone whether I felt that way or not, but actually I did think like that...it depends on how far i'll be able to express. Q: It seems you're going to Okinawa for filming? Mario: Thank you very much! (LOL) I look forward to Okinawa. It's really wonderful, isn't it? Going to Okinawa to create a movie. It feels that something will be liberated in it compared to in the metro. I think when we go to the actual site, a wider world view will flood us, and it will make the filming easier. Wada: I think that it'll become something like a training camp, like what we usually do in stage rehearsals. Even in butai, the members have time to gather and create together, so I think that if we are able to have discussions not only about each other's roles but about sharing the entire work as a whole, we'll be able to create a really good performance. Q: So basically it's like an "eating out of the same pot" (living together) kind of movie creation. Director: Actually it would be unpleasant if you stay in a high-class hotel room meant for just two people, right? Mario: We're paying our own shares so let us stay in a hotel (LOL). I'm looking forward to it for different reasons! Q: How many times have you two been to Okinawa? Wada: It's the first time for me. Mario: For me it's the second time. I first went here for a calendar photoshoot. It was the nearest location within the country that gives off a feeling similar to being in another country. Director: This time, instead of going for a resort kind of feel, we're layering the protagonists' emotions with the ambiance of the southern islands just before beach season. It's a bit melancholy, but the weather is clear, something like that.